The current spread between nominal 10-year Treasuries at 3.68% (data) and 10-year TIPS (data) at 1.30% has increased slightly over the last few months, to the current level of 238 basis points as of February 4. But the current spread is still below the 250 basis point average during 2004, 2005, 2006, 2007 and the first half of 2008 (see chart above). At least by this Treasury bond-market derived estimate of future inflation, there don't appear to be any inflationary pressures building yet. TIPS are based on CPI. if you doubt CPI, then TIPS are a lousy inflation hedge. my friend who runs a hedge fund based entirely on inflation speculation has referred to the TIPS as "utterly useless". I agree. 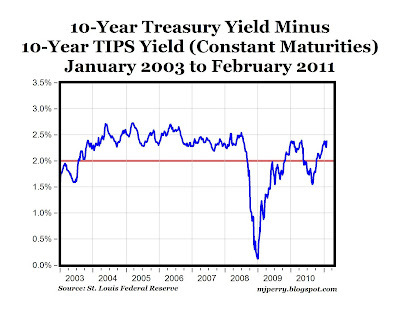 But Mark misses the bigger point; the FED is intervening in the bond market and is now the biggest buyer of treasuries. The BLS is playing games and producing fake numbers. 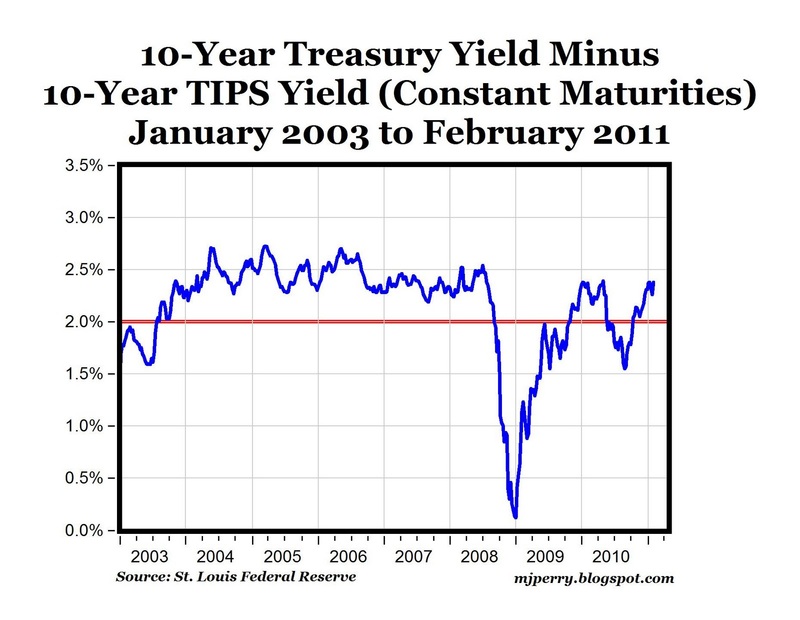 There is no free market in treasuries to tell us anything meaningful. what, you mean that buying 40% of auctions might influence price in the bond market? i completely agree that the bond market is totally rigged right now in an unprecedented fashion. this makes it useless as barometer for the underlying financial situation and sentiment. If you think everything is a conspiracy and a cover up, there is no point in arguing. There are some private inflation indicators out there (none of which I could find on a random google search) but they are all telling the same story BLS statistics are saying. If you focus on one item getting more expensive (gas) and say that means there is inflation...well, that's kinda crazy and intellectually incompetent. Nonsense. If you use the exact same methodology as was being used under the Carter Administration you get a CPI reading of more than 5%. "There are some private inflation indicators out there (none of which I could find on a random google search) but they are all telling the same story BLS statistics are saying." Roman, if you are going to use something like this to support your argument, you need to be able to cite these sources. Believing in the "Magic of the Marketplace"